Welcome to the Holiday Inn Express Times Square South. Enjoy a calm, peaceful haven in the heart of NYC! 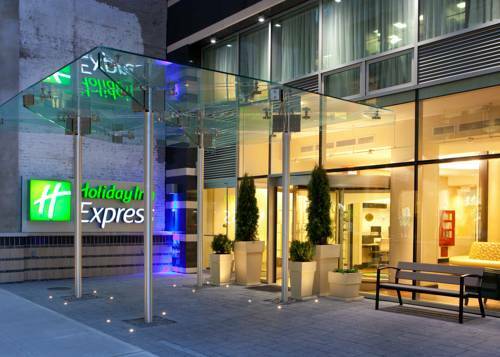 You are a part of it all when you "Stay Smart" at the Holiday Inn Express Times Square South on 36th Street which is centrally located in the heart of midtown. You are steps away from fabulous shopping and famous landmarks. Business travelers are minutes away from their offices of Macy's, Marsh and McLennan, Verizon, Google, JP Morgan Chase, On Deck Capital, and McGraw Hill. All are within walking distance of our location in Manhattan near the Empire State building and Times Square. Our hotel's guests can stay productive in our 24-hour Business Center with copy, fax, printing and computer services as well. There is so much to do whether you want to catch a Broadway play, visit the Modern Museum of Art, browse the shops on Fifth Avenue or enjoy the sites at Chelsea Pier, the Holiday Inn Express� Times Square South hotel on 36th Street is located near the best of Manhattan and Times Square. Our hotel's guests can go skating at Rockefeller Center, stroll in Central Park or Bryant Park or take an evening cruise around New York City. You'll take delight in magnificent skyscraper views, our impeccable customer service and terrific, complimentary amenities. Take advantage of our free, hot breakfast bar. With a name you can trust and a price you can afford, we'll indulge you with a practical and very enjoyable experience! Children's program - Chelsea Piers has so many things for the family to do they have a sky rink � sports and entertainment � rock climbing wall � skate rental � year round ice skating "A gigantic sports and entertainment center, Chelsea Piers is fun for the entire family. Penn Station is the commuter hub which has trains from Long Island Railroad , New Jersery Transiit and Amtrak. The Golf Club at Chelsea Piers, Manhattan's only multi-tiered, year-round outdoor driving range, offers the unique opportunity to hit full shots, practice putting and take lessons from top golf professionals. Located on Hudson River pier.